The Arizona Coyotes are a professional ice hockey team based in the Phoenix suburb of Glendale, Arizona. They are members of the Pacific Division of the Western Conference of the National Hockey League (NHL). The Coyotes first played at America West Arena in downtown Phoenix, before moving to Glendale's Gila River Arena in 2003. In 2021, the Coyotes are scheduled to return to the Central Division when an expansion team in Seattle joins the league. The franchise played in Winnipeg as the Jets from 1972 to 1996. They were originally members of the WHA before joining the NHL in 1979. However, the club was never able to translate its WHA success into the NHL after the merger. The merger's terms allowed the established NHL teams to reclaim most of the players that had jumped to the upstart league, and the Jets lost most of their best players in the ensuing reclamation draft. As a result, they finished last in the NHL during their first two seasons, including a nine-win season in 1980–81 that is still the worst in franchise history. However, they recovered fairly quickly, making the playoffs 11 times in the next 15 seasons. But the Jets only won two playoff series, largely due to being in the same division as the powerful Edmonton Oilers and Calgary Flames. Because of the way the playoffs were structured for much of their Winnipeg run, the team was all but assured of having to defeat either the Oilers or the Flames (or both) to reach the Conference Finals. In 1984–85, for instance, they finished with the fifth-best record in the NHL, only to be eliminated by the Oilers in the division finals. Two seasons later, they dispatched the Flames in the first round, only to be eliminated again by the Oilers in the division finals. The franchise would not win another playoff series for 25 years. The Jets ran into financial trouble when player salaries began spiraling up in the 1990s; this hit the Canadian teams particularly hard. Winnipeg was the second-smallest market in the NHL for most of the Jets' existence, and after the Quebec Nordiques moved to Denver in 1995 to become the Colorado Avalanche, it became the smallest market. In addition, the club's home arena, Winnipeg Arena, was one of the smallest in the league. Despite strong fan support, several attempts to keep the team in Winnipeg fell through. In December 1995, Jerry Colangelo, owner of the National Basketball Association's Phoenix Suns; Phoenix businessmen Steven Gluckstern and Richard Burke; and a local investor group purchased the team with plans to move it to Phoenix for the 1996–97 season. After the franchise considered "Mustangs", "Outlaws", "Wranglers" and "Freeze", a name-the-team contest yielded the nickname "Coyotes", which finished ahead of the second-place "Scorpions". Shane Doan was team captain from 2003 to 2017. Holding the franchise record for games played, he was the last Coyotes player to have also played in Winnipeg. In the summer the move occurred, Jets star Alexei Zhamnov left the team, while the team added established superstar Jeremy Roenick from the Chicago Blackhawks. Roenick teamed up with power wingers Keith Tkachuk and Rick Tocchet to form a dynamic 1–2–3 offensive punch that led the Coyotes through their first years in Arizona. Also impressive were young players like Shane Doan (he would also be the last remaining player from the team's days in Winnipeg), Oleg Tverdovsky and goaltender Nikolai Khabibulin, whom the fans nicknamed the "Bulin Wall". Another key addition to the squad was veteran forward Mike Gartner, who had joined from the Toronto Maple Leafs. Despite his experience and scoring his 700th career goal on December 15, 1997, Gartner battled injuries in the latter half of the 1997–98 season. 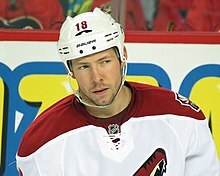 The Coyotes did not renew his contract and he retired at the end of the season. After arriving in Phoenix, the team posted six consecutive .500 or better seasons, making the playoffs in every year but one. The one time they did not make the playoffs, in 2000–01, they became the first team to earn 90 points and miss the playoffs. The Coyotes' original home, America West Arena, was suboptimal for hockey. Although considered a state-of-the-art arena when built for the Phoenix Suns, unlike most modern arenas, it was not designed with a hockey rink in mind. The floor was just barely large enough to fit a standard NHL rink, forcing the Coyotes to hastily re-engineer it to accommodate the 200-foot rink. The configuration left a portion of one end of the upper deck hanging over the boards and ice, obscuring almost a third of the rink and one goal from several sections. As a result, listed capacity had to be cut down from over 18,000 seats to just over 16,000 – the second-smallest in the league at the time – after the first season. Richard Burke bought-out Steven Gluckstern in 1998, but was unable to attract more investors to alleviate the team's financial woes (see below). In 2001, Burke sold the team to Phoenix-area developer Steve Ellman, with Wayne Gretzky as a part-owner and head of hockey operations. From then until the 2007–08 season, the Coyotes were barely competitive and managed to break the 80-point barrier only once during that time. Attendance levels dropped considerably, worrying many NHL executives. In addition, an unfavorable arena lease at city-owned America West Arena had the team suffering massive financial losses (as much as $40 million a year at one point); the Coyotes have yet to recover from the resulting financial problems. The team moved into Glendale Arena (now known as Gila River Arena) about two-and-a-half months into the 2003–04 NHL season. Ellman put forward numerous proposals to improve the hockey sight lines in America West Arena in hopes of boosting capacity back over the 17,000 mark. However, none of these got beyond the planning stages, leading Ellman to commit to building a new arena. Simultaneously, the team changed its logo and uniforms, moving from the multi-colored kit to a more streamlined look. In 2005, Ellman sold the Coyotes, the National Lacrosse League's Arizona Sting and the lease to Gila River Arena to trucking magnate Jerry Moyes, who is also a part-owner of Major League Baseball's Arizona Diamondbacks. On August 6, 2005, Brett Hull, son of former Jet Bobby Hull, was signed and promptly assigned the elder Hull's retired number 9. Two days later, Gretzky named himself head coach, replacing Rick Bowness, despite the fact he had never coached at any level of hockey. The Coyotes "Ring of Honor" was unveiled on October 8, inducting Gretzky (who had never played for the organization, but whose number 99 was retired by all NHL teams after his retirement in 1999) and Bobby Hull. Only a week later, Brett Hull announced his retirement. On January 21, 2006, Jets great Thomas Steen was the third inductee to the "Ring of Honor". Drafted in 2005, Martin Hanzal was with the team from 2007 to 2017. Another moment in a series of bad luck: the Coyotes were planning to host the 2006 NHL All-Star Game, but the event was canceled because of the 2006 Winter Olympics. The team returned to Winnipeg on September 17, 2006, to play a pre-season game against the Edmonton Oilers, but were shut-out 5–0 before a sellout crowd of 15,015. On April 11, 2007, CEO Jeff Shumway announced that General Manager Michael Barnett (Gretzky's agent for over 20 years), senior executive vice president of hockey operations Cliff Fletcher and San Antonio Rampage's general manager and Coyotes' assistant general manager Laurence Gilman "have been relieved of their duties". The Coyotes finished the 2006–2007 season 31–46–5, their worst record since relocating to Phoenix. On May 29, 2007, Jeff Shumway announced Don Maloney had agreed to a multi-year contract to become general manager of the Coyotes. As per club policy, the terms of the contract were not disclosed. However, as has been the case with all general managers since 2001, Maloney serves in an advisory role to Gretzky. Named head coach in September 2009, Dave Tippett led the Coyotes to their first division championship and three consecutive playoffs. Tippett left the Coyotes in 2017. On March 27, 2010, the Coyotes clinched a playoff spot, their first playoff spot since the 2001–02 season, and in the process, reached the 100-point mark for the first time ever as an NHL team, and the first time overall since the 1977–78 (WHA) Jets scored 102 points. They finished with 107 points, the highest point total in the franchise's 38-year history. This was good enough for fourth overall in the NHL, tying the 1984–85 Jets for the franchise's highest finish as an NHL team. They also qualified for the fourth seed in the Western Conference, giving them home-ice advantage in the first round for the first time since 1985. On April 7, 2012, the Coyotes defeated the Minnesota Wild with a score of 4–1 to win the Pacific Division title—their first division title as an NHL team (in Winnipeg or Phoenix). This gave them the third seed in the West, and with it home ice advantage in a playoff series for only the third time in franchise history. In the first round, they defeated the Chicago Blackhawks in six games, the franchise's first playoff series win since 1987. The first five games went to overtime, tying a record when the Montreal Canadiens and Toronto Maple Leafs did it in the 1951 Stanley Cup Final. They faced the Nashville Predators in the second round, winning the first two games and the series 4–1. However, in the Western Conference finals, the Coyotes fell to the Los Angeles Kings in game five of a 4–1 series. In December 2008, the media became aware the Coyotes were suffering massive losses and that the NHL was paying the team's bills. The media reports were minimized by NHL commissioner Gary Bettman and vice-president Bill Daly. However, Moyes had secretly given operational control of the team to the league. In May 2009, Moyes put the team into bankruptcy hours before Bettman was to present him an offer to sell the team to Chicago Bulls and Chicago White Sox owner Jerry Reinsdorf. Moyes intended to sell the team to Canadian billionaire Jim Balsillie, who intended to purchase the team out of bankruptcy and move it to Hamilton, Ontario. The NHL responded by stripping Moyes of his remaining ownership authority. From May until September 2009, hearings were held in Phoenix bankruptcy court to determine the fate of the Coyotes and the holding company. Two potential bidders for the team surfaced, Reinsdorf and Ice Edge Holdings, but they did not submit a bid for the team. Instead, the NHL put in the only rival bid to Balsillie for the team, while it contended the Moyes–Balsillie deal violated NHL rules. The bankruptcy court voided the planned sale to Balsillie, accepting the NHL's argument that bankruptcy could not be used to circumvent NHL rules. The NHL's bid was also declared insufficient, but the judge left the window open to an improved bid. Moyes and the NHL settled, with the NHL purchasing the team and assuming all debts. The NHL negotiated a temporary lease with the City of Glendale, which owns Gila River Arena. The NHL then negotiated with Reinsdorf and Ice Edge to negotiate a deal with Glendale. Ice Edge signed a letter of intent to purchase the team from the NHL, while Reinsdorf had won the approval of the City of Glendale. On May 7, 2010, ESPN.com reported the Reinsdorf bid had fallen apart and that the City of Glendale was working with Ice Edge to purchase the team in a last-ditch effort to keep them in Arizona. The National Post criticized both bids, as they were conditional on municipal taxpayers covering any losses the Coyotes might incur, and suggested that keeping the team in Phoenix was never economically viable. In July 2010, the Ice Edge bid collapsed because it did not satisfy Glendale's financial conditions. Ice Edge decided to concentrate on an effort to purchase a minor league team. The City of Glendale had to step in and guarantee the team's losses for 2010–11 as a precondition of the NHL not transferring the franchise. A consortium of investors led by Chicago investor Matt Hulsizer then reached a deal to purchase the Coyotes from the NHL along with a lease agreement with Glendale. However, the Hulsizer deal collapsed in late June 2011 at least in part due to a threatened suit by the Goldwater Institute over the legality of payments Glendale would make to Hulsizer prior to the consortium buying the team. The threat of the suit may have prevented the sale of bonds to finance the payments. The team only stayed in the Phoenix area for the 2011–12 season after another $25 million payment by the City of Glendale. The 2012–13 NHL lockout provided another opportunity for the Coyotes to find a potential owner and avoid relocation while the NHL suspended team operations during the labor dispute. A deal to former San Jose Sharks owner Greg Jamison had been drafted just as the lockout ended, but failed to be finalized and fulfilled by January 31, 2013. The deal would have kept the Coyotes in Phoenix for the next 20 years relying on a taxpayer subsidy, according to the agreement. It would also have had "Phoenix" dropped from the name and instead use "Arizona". California investment executive Darin Pastor also submitted a bid to purchase the Coyotes. His bid proposed to keep the team in the Glendale area while engaging young hockey players in the region through school partnerships and scholarship efforts. The NHL rejected Pastor's bid on May 13, 2013, citing the bid was "inconsistent with what we had previously indicated were the minimum prerequisites" of a bid. Due to the team's bankruptcy status since 2009 and the annual revenue lost each year, the NHL planned to move the Coyotes should a deal with the city for a new lease and new ownership not be decided by July 2, 2013. The plan was to move the franchise to a new city, likely Seattle. On July 2, 2013, by a vote of 4–3, the Glendale City Council approved a 15-year lease agreement with Renaissance Sports and Entertainment (RSE), which would purchase the team from the NHL for US$225 million by August 5, 2013. The members of the Canadian group are Executive Chairman & Governor George Gosbee; President, CEO & Alternate Governor Anthony LeBlanc; Alternate Governor Craig Stewart; and Directors Gary J. Drummond, W. David Duckett, William "Bill" Dutton, Robert Gwin, Scott Saxberg and Richard Walter. RSE partnered with Global Spectrum (owners of the Philadelphia Flyers) for help in managing Gila River Arena. The agreement has the City of Glendale giving RSE US$15 million per year for management fees. There is a clause stipulating RSE can relocate the team after five years if it accrues US$50 million in losses. David Moss during the 2013–14 season. He scored the club's final goal under the Phoenix moniker on April 13, 2014. The club was renamed the Arizona Coyotes the next season. On January 29, 2014, the new ownership group announced the team would change its name to the "Arizona Coyotes" for the 2014–15 season. According to Coyotes club president Anthony LeBlanc, the change is being made to reflect the fact the team is no longer located within Phoenix city limits and to include all hockey fans in the state of Arizona. Aside from a new shoulder patch, the team's uniform design did not change. On June 4, 2014, it was reported that a Scottsdale, Arizona, public-relations firm had sued IceArizona, the owner of the Phoenix Coyotes, alleging the NHL club had reneged on a sponsorship deal worth nearly $250,000. A Coyotes spokesman responded to this issue by calling it a "quarter-million-dollar scheme". By October, IceArizona entered a deal to sell 51% of the Coyotes to Philadelphia-based hedge fund manager Andrew Barroway, who had recently failed in his attempt to purchase the New York Islanders. The deal was approved by the NHL Board of Governors on December 31, 2014. During the 2014–15 season, the team finished last in the Pacific Division with the second-worst record in the NHL. On June 10, 2015, Glendale City Council voted to terminate its 15-year, $225 million agreement with the Coyotes. "The city claimed it was entitled to terminate the agreement because two former city employees, Craig Tindall and Julie Frisoni, were involved in securing the deal and later worked for the Coyotes." On July 23, 2015, it was announced the Coyotes and City Council had agreed on a resolution. On July 24, 2015, the Coyotes announced City Council had reached a two-year deal. At the conclusion of the 2015–16 season, Coyotes general manager Don Maloney was terminated from his position after eight seasons and one General Manager of the Year award. The Coyotes replaced Maloney with John Chayka, who became the NHL's youngest GM, being promoted from his position as assistant general manager/analytics within the Coyotes staff. In August 2016, Dawn Braid was hired as the Coyotes' skating coach, making her the first female full-time coach in the NHL. On November 14, 2016, the Coyotes announced plans to build a new arena in Tempe, Arizona, which was scheduled to be completed for the 2019–20 NHL season. The project would have included an adjoining 4,000-seat arena that would be used for Coyotes practices and as the home for the Arizona State University men's hockey team. However, the arena project was withdrawn when ASU pulled out of the deal in February 2017. At the end of the 2016–17 season, Barroway bought out the rest of the IceArizona ownership group and became the sole owner of the franchise. Following the transfer, former IceArizona CEO Anthony LeBlanc and the director of hockey operations Gary Drummond both left the organization. On June 19, 2017, the Coyotes opted not to re-sign long time captain Shane Doan, who had been with the franchise since they were the Winnipeg Jets. The Coyotes left Doan a standing offer to remain with the team in a non-playing role. On June 22, 2017, head coach Dave Tippett would also leave his positions within the Coyotes after eight seasons, and would be succeeded by Rick Tocchet on July 11, 2017. On December 4, 2018, it was announced that the team will move to the Central Division in 2021, changing divisions for the first time since relocating to Arizona, as part of a league realignment following the addition of Seattle expansion team. The team previously played in the Central Division for the first two seasons, following their relocation from Winnipeg in 1996. Upon the franchise's relocation to Phoenix, a public team-naming vote was held, with "Coyotes" defeating "Scorpions" amongst the finalists. Both coyotes and scorpions are inhabitants of the Sonoran Desert, and the owners/supporters of the club wanted the team name to be an animal that was representative of the region. On June 27, 2014, the team changed its geographic name from "Phoenix" to "Arizona". The Coyotes first logo, a kachina-style coyote, used from 1996 to 2003. As the NHL switched home and road jerseys beginning in the 2003–04 season, and coinciding with the team's move from America West Arena to the newly completed Glendale Arena, the Coyotes redesigned their look completely, adopting the current howling coyote head logo while dropping several colors from the team's palette. Sedona red and white became the primary colors, with desert sand and black remaining as logo trim colors. A variation of these colors was later used for the Major League Baseball team Arizona Diamondbacks. The uniform's simplified two-color scheme with three stripes on each sleeve and the tail bears some resemblance to later versions of the Montreal Maroons jerseys. The team also changed its shoulder patch, taking the form of the outline of the state of Arizona, with an homage to the state flag and the abbreviation "PHX". This logo was worn only on the right shoulder leaving the left shoulder bare. 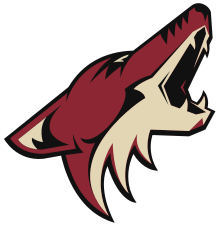 The Coyotes shoulder patch, used from 2003 to 2014. The Coyotes updated their jerseys for the 2007–08 season, along with all NHL teams, as part of the switchover to "Rbk Edge" jerseys. The changes made were adding an NHL crest just below the neck opening, removing the stripes that were previously just above the lower hem, and moving the "PHX" patch from the right to the left shoulder. The white jersey also gained red shoulder coloring and laces at the collar. The three-stripe pattern is applied to the side of the pants. Before the 2014–15 season, it was announced the Coyotes' third jersey would no longer be used. The patch on the home and away jerseys that used to read "PHX" would also be changed to read "AZ" to match the team's rebranded name. On June 26, 2015, the Coyotes introduced updated jerseys. The Coyotes also began to wear their black kachina jerseys for a few dates from the 2014–15 to the 2016–17 seasons. The style was similar to the originals but was adopted to the Reebok Edge cut. For the 2018–19 season and beyond, the Coyotes will revive the kachina uniforms as a third jersey, and is now updated to the Adidas' adizero cut. Howler is the coyote-suited mascot of the Arizona Coyotes. He was introduced on October 15, 2005. The Coyotes' official kids club is called Howler's Kids Club. Howler wears number 96 on his jersey, representing the year the Winnipeg Jets moved to Arizona, and wears an "M" designation for Mascot. He is known to beat on a bucket to encourage the fans to cheer, and has many different outfits in games. 1 Hull's #9 was unretired briefly upon his request at the beginning of the 2005–06 season for his son, Brett, before he retired five games into the season. 2 Hull and Steen played only for the original Winnipeg Jets, and had their numbers retired when the team played in Winnipeg. The Coyotes continue to honor these numbers in the Ring of Honor. 4 Gretzky never played for the franchise, but was a part-owner and coach for the Coyotes. Thus his number, retired league-wide since 2000, is on the Coyotes' Ring of Honor. The NHL had retired his number for all its member teams at the 2000 NHL All-Star Game. 5 Shane Doan's #19 was officially retired on February 24, 2019, making his number the first to be officially retired by the franchise with the first banner hanging in the arena. These are the top-ten point-scorers in team history. Figures are updated after each completed NHL regular season. Keith Yandle set the franchise record for most points in a single season by a defenseman, recording 59 points in the 2010–11 season. ^ "Logo and Uniform History" (PDF). 2018–2019 Arizona Coyotes Media Guide. NHL Enterprises, L.P. September 21, 2018. Retrieved December 21, 2018. With the opening of their new arena in Glendale, the time had come for a new set of logos and uniforms to reflect the aggressiveness and excitement of Coyotes hockey in the new arena while maintaining ties to seven years of Arizona history. The official Coyotes colors were now brick red, desert sand and black – three colors that were all included in the original Coyotes logo. ^ "2015-2018 Arizona Coyotes–Greatest NHL Uniforms". 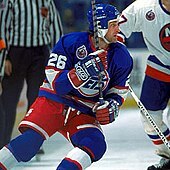 GreatestNHLUniforms.com. NHL Enterprises, L.P. Archived from the original on 2018-05-09. Retrieved May 8, 2018. ^ a b "Seattle Awarded National Hockey League's 32nd Franchise". NHL Enterprises, L.P. December 4, 2018. Retrieved December 4, 2018. ^ "Coyotes Finally have owner". ESPN. Associated Press. Retrieved August 5, 2013. ^ a b c "Team Name Will Change to Arizona Coyotes at NHL Entry Draft on June 27". Arizona Coyotes. June 23, 2014. Retrieved June 30, 2014. ^ "After threat to move, Arizona Coyotes staying 1 more year in Glendale". The Arizona Republic. December 19, 2017. ^ Burnside, Scott. Balsillie again takes wrong approach. ESPN, 2009-05-06. ^ Jerry, Brown (2010-03-28). "Coyotes reach the 100-point mark by routing avs". National Hockey League. Retrieved 2010-03-28. ^ Myers, Dan (2012-04-07). "Coyotes clinch Pacific with 4–1 win". National Hockey League. Retrieved 2012-04-07. ^ "PROSPECTIVE COYOTES OWNER TO GET $15M/YEAR TO MANAGE ARENA". Archived from the original on 2012-06-08. Retrieved 2012-06-06. ^ "Darin Pastor submits bid to NHL to buy Phoenix Coyotes – Phoenix Business Journal". The Business Journals. 2013-05-10. Retrieved 2014-06-10. ^ "NHL rejects Pastor's bid to purchase Coyotes". Fox Sports Arizona. 2013-05-13. Retrieved 2014-06-10. ^ "NHL closer to Seattle? Deal to keep Coyotes in Phoenix hits 'potential snag' – Local". MyNorthwest.com. 2013-06-20. Retrieved 2014-06-10. ^ a b "Glendale, Ariz., city council ratifies Phoenix Coyotes arena lease agreement". ESPN. 2013-07-03. Retrieved 2014-06-10. ^ "Phoenix Coyotes franchise to become Arizona Coyotes for 2014–15". National Hockey League. January 29, 2014. Retrieved 29 January 2014. ^ "Phoenix Coyotes deal with Glendale will come up short". The Arizona Republic. 2014-05-28. Retrieved 2015-07-12. ^ "Phoenix Coyotes owner sued by Scottsdale PR firm". The Arizona Republic. 2014-06-04. Retrieved 2015-07-12. ^ "Coyotes agree to sell controlling interest to Andrew Barroway". Fox Sports. 2014-10-10. Retrieved 2015-07-12. ^ "Board of Governors approves sale of majority stake in Coyotes". Retrieved 31 December 2014. ^ "Judge orders Glendale to pay Coyotes $3.75 million". Retrieved 2015-10-07. ^ "Coyotes and City of Glendale Agree on Resolution". National Hockey League. July 23, 2015. Retrieved July 23, 2015. ^ "Coyotes, Glendale reach resolution on arena lease dispute". ESPN. July 23, 2015. Retrieved July 23, 2015. ^ "Glendale Approves 2-Year Agreement with Coyotes". National Hockey League. 24 July 2015. Retrieved 25 July 2015. ^ "Sources: Don Maloney out as Arizona Coyotes GM". The Arizona Republic. April 11, 2016. ^ "Coyotes Name Chayka as General Manager". National Hockey League. 2016-05-05. Retrieved 2016-09-01. ^ Bieler, Des. "NHL's first female full-time coach hired by Arizona Coyotes". The Washington Post. Retrieved 2016-08-25. ^ "Coyotes Announce Plans for New East Valley Arena". National Hockey League. November 14, 2016. Retrieved November 14, 2016. ^ Burnside, Scott (November 14, 2016). "Coyotes have agreement on new stadium deal". ESPN. Retrieved November 14, 2016. ^ Wyshynski, Greg (February 3, 2017). "Arizona Coyotes arena deal dead, ASU pulls out". Puck Daddy. Yahoo! Sports. Retrieved February 14, 2017. ^ "Coyotes CEO Anthony LeBlanc, hockey ops chief Gary Drummond step down". ESPN. June 16, 2017. ^ "Coyotes parting ways with captain Doan - Article - TSN". TSN. 2017-06-19. Retrieved 2017-06-23. ^ "Coyotes and Tippett Part Ways". National Hockey League. June 22, 2017. Retrieved June 23, 2017. ^ Vest, Dave (July 11, 2017). "Tocchet Likes Fit with Coyotes". National Hockey League. Retrieved July 13, 2017. ^ Marrazza, Dan (8 November 2016). "How NHL Teams Got Their Names". vegasishockey.com. Black Knight Sports & Entertainment LLC. Archived from the original on 2016-11-10. Retrieved 9 November 2016. ^ "COYOTES UNVEIL NEW RBK EDGE UNIFORMS". National Hockey League. September 14, 2007. Retrieved May 8, 2018. ^ "Coyotes Reveal New Uniforms at NHL Draft Party" (Press release). National Hockey League. June 26, 2015. Retrieved June 18, 2016. ^ "Coyotes Announce Black Kachina Sweater As Team's Official Third Jersey" (Press release). National Hockey League. June 22, 2018. Retrieved June 25, 2018. ^ "HOWLER'S KIDS CLUB". Arizona Coyotes. Archived from the original on 2014-07-03. Retrieved July 8, 2014. ^ "Arizona Coyotes Roster". NHL.com. Retrieved January 12, 2019. ^ "Arizona Coyotes Hockey Transactions". TSN.ca. Retrieved October 3, 2017. ^ "Coyotes roll out red carpet for Doan during retirement ceremony". NHL.com. Retrieved 2019-02-25. ^ "Merkley, Nicholas – 2015 NHL Draft Prospects". National Hockey League. 1997-05-23. Retrieved 2015-07-12. ^ "Coyotes Select Keller, Chychrun in First Round". National Hockey League. 2016-06-24. Retrieved 2016-06-25. ^ a b "Rule 6 – Captain and Alternate Captains". National Hockey League. Retrieved 2009-02-23. ^ "Coyotes Name Ekman-Larsson Team Captain". National Hockey League. September 13, 2018. ^ "Hockey Operations". National Hockey League. September 1, 2016. Retrieved September 1, 2016. ^ "Coyotes Name Patterson as President & CEO". National Hockey League. July 12, 2017. Retrieved July 13, 2017. ^ "Slaney Thrilled to Be Coaching in NHL with Coyotes". National Hockey League. 10 July 2015. Retrieved July 12, 2015. ^ "Coyotes Confident Potvin Can Help Players Improve Skills". National Hockey League. September 1, 2016. Retrieved September 1, 2016. ^ "Dawn Braid named Coyotes skating coach". National Hockey League. 24 August 2016. Retrieved August 24, 2016.